Outhouse race during the chili festival? Seems appropriate. The Fourth of July weekend is just the start of a series of promising events that will make Big Bear Lake THE place to be. We covered many, but not all, of the events going on this weekend in last week’s blog. This week we spent some time looking at the rest of the month, and we are seeing more of the kind of events people talk about all year. On top of all these, there is always bicycling, golfing, fishing, visiting the animals at the Big Bear Alpine Zoo, and just exploring the area. The weather over the next week is going to be warm and mostly sunny, so come up and enjoy it! If you like your rock from the 90’s, Murmur and The Joshua Tree will be playing classics from R.E.M. and U2, respectively on July 20. Foasis will round out a big weekend on July 21 when they take the music of Oasis to The Cave’s stage. Closing out a big month at The Cave will be the Duke Michaels & Dennis Jones Band on July 27. They bring a wide range of music with them, from blues to rock and every stop in between. Music in the Mountains will also be continuing their musical summer with DSB, the world’s best Journey tribute band and a journey through the British Invasion with The British Beat on July 20. Tickets are starting to sell out, so get yours soon! This event gets it own heading. This three day event, from July 12-14, will take place at various venues around the community, and all of it will be worth seeing. Start the day with Breakfast and Bluegrass on the Miss Liberty, take a Haywagon Ride through the Village, listen to some Bluegrass on the Beach, and check out some of the Nightgrass concerts with your headliners. If you want to try a little bluegrass music yourself, there will be workshops through the weekend to help. Travelling from venue to venue can make you a little hungry. The Old Miners thought of that, and will be having a chili cook off on Saturday, July 13. Admission is free and$5 will cover your fee for a tasting kit. If you are a gambling sort, you can bid on the winning chili booth at the Calcutta dinner the night before. That weekend will also have the 3rd Annual Old Miners Outhouse races on July 13th, where we will find out who has built the fastest outhouse in the West! 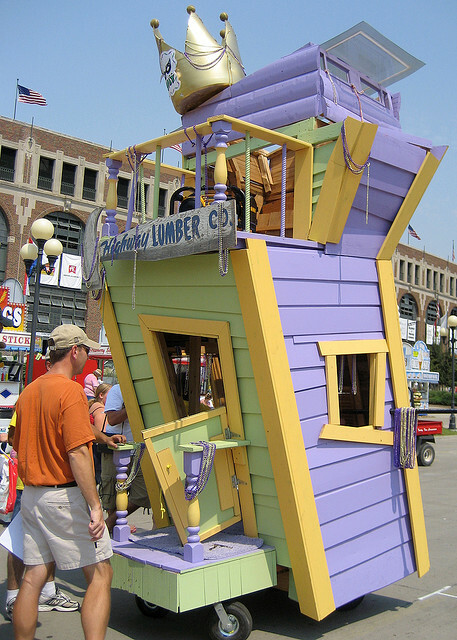 Round out the month with the Doo Dah Parade on July 27. Don’t expect a tradition parade – instead, this one is a hilarious parody. Come and see all of the fun the local residents and visitors have watching the well-made and entertaining floats. Just the music and the Miners will keep you coming up all month! Next weekend will have a health fair at the Elks Lodge, the Brews for Food beer and spirits fest, the fourth of six Aaron’s Big Bear Lake Bass Tournaments, and “Madagascar” being shown at the Swim Beach Amphitheater. What are you waiting for? Put in your reservations now so you have time to come up and experience all the great events Big Bear Lake has in store for the month of July. Enjoy your Fourth of July festivities! Gallery | This entry was posted in What to see and do and tagged Adventure, Big Bear CA, big bear lake, biking, cabins, chili, Chili Cook Off, cycling, Dining, Doo Dah, events, family, Fawnskin, fishing, Fishing Tournament, hiking, holiday events, lake, mountain, music, Old Miners, Outhouse, parade, summer, The Cave, vacation, weather, What to Do. Bookmark the permalink.